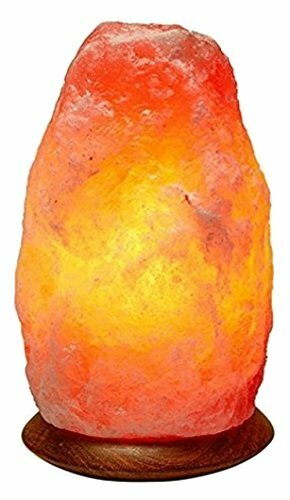 Brighten your room with the Windsor Seasons Himalayan Natural Crystal Salt Lamp. The warm amber light from this lamp complements any space, while also activating the salt crystal to purify the air. Natural Ionizer and Air Purifier. Anecdotal evidence shows each lamp emits ions that counter-balance electromagnetic radiation reducing physical fatigue, stress and sluggishness. This natural ionization pulls harmful contaminants and allergens out of the air so you can breathe easier and enjoy a more restful sleep. After a long, stressful day, the Salt Lamp's calming amber glow and natural negative ion balance aids in relaxing you and reduces your stress levels. Great natural remedy Anecdotal evidence for fighting insomnia, allergies, asthma, anxiety or stress-related issues. Control the Glow. Our dimmer control switch helps adjust the brightness level of the Salt Lamp to suit your mood. Whether you'd prefer a luminous glow for reading and relaxing, soft illumination to lull yourself to a deep sleep or for any level in between you can choose your perfect setting. Once lit the lamp will emit a calming amber glow. Unique and Hand Crafted. Each lamp is hand-mined in the Himalayan Mountains and is unique in shape and form the height varies whilst retaining its weight. 1.5kg +/- 200g. This lamp makes for a naturally beautiful accessory. Only the purest salt rock is used for each lamp. Contents include Himalayan Salt Lamp, 6 ft UL approved cord with dimmer switch, 15w bulb and wood base attached to the salt lamp. 100% satisfaction or your money back! Order now and give your home a new, vibrant energy, pleasant ambience and contemporary edge. ONLY THE PUREST HIMALAYAN CRYSTAL ROCK SALT from the world famous Khewra mines. Our lamp is exclusively carved internally and externally for the best possible GLOW. Salt crystals with the best clarity, shape, color and purity are hand-selected for the highest quality. 5- 6" in height. THERAPEUTIC HEALTH BENEFITS ANECDOTAL EVIDENCE SHOWS IT WORKS AS AN IONIZER AND AIR PURIFIER: The lamp emits negative ions that fight against electromagnetic radiation and fight fatigue and sluggishness.The naturally ionized air also helps you sleep better at night, allowing you to wake with an enhanced mood and feeling refreshed. NATURAL GLOW: Accentuate your living or workspace with warm lighting, casting a calming amber glow. Each lamp is hand-mined in the Himalayan Mountains and carved in a unique shape by our master craftsmen. EXCLUSIVELY CARVED WITH A GENUINE NEEM WOOD BASE: Each lamp is hand-mined in the Himalayan Mountains and is unique in shape and form. As the lamp is carved by hand the height can vary by +/-10% whilst retaining its weight 1.25kg +/- 200g. This is a beautiful lamp loved by our customers. If you have any questions about this product by Windsor Seasons, contact us by completing and submitting the form below. If you are looking for a specif part number, please include it with your message.